Are you picnic-ing today? Firing up the grill? My Chief Culinary Consultant and I are cooking out and having some people over; our menu includes hamburgers, beer and brown sugar kielbasa with sauerkraut, my favorite potato salad, Chinese coleslaw, fruit salad, corn pudding, and of course, some strawberry pretzel salad for dessert. If you’re headed to a party (or are having one at your house) and need something easy and last minute for dessert, this trifle is perfect. Plus, it feeds a crowd, is festive, and tastes fabulous. 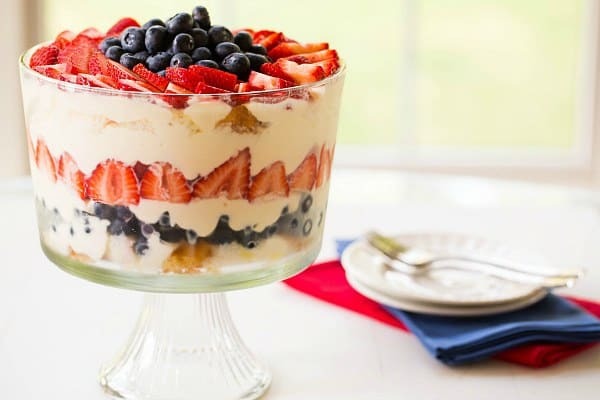 This pretty berry trifle is made up of layers of angel food cake, a cream cheese/pudding/Cool Whip mixture, blueberries and strawberries. It’s wonderfully light and refreshing, and reminds me of everything sensational about summer. I love anytime I can create something that includes angel food cake, strawberries and Cool Whip. Suddenly, it’s 1988 and I’m in my grandma’s house again. 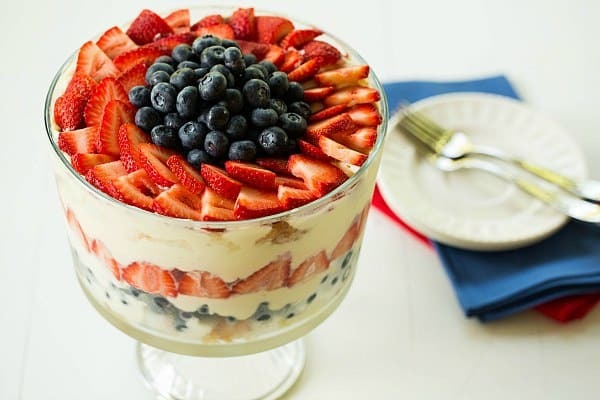 Whether you want a little slice of nostalgia, are in need of something quick to whip together for today, or want to add one more red, white and blue item to your menu, you’ll love this dessert. Have a safe and fun holiday! A festive and colorful triple with layers of angel food cake, blueberries and strawberries. In a small bowl, combine the vanilla pudding mix with the milk and whisk for two minutes; set aside. In a large bowl, beat the cream cheese on medium speed until smooth and creamy, 2 to 3 minutes. 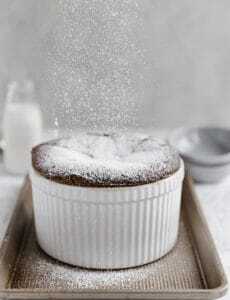 Reduce the speed to low and gradually add the powdered sugar. Once all of the sugar is incorporated, increase the speed to medium and beat for 1 minute, or until thoroughly combined and smooth. Add the prepared pudding to the cream cheese mixture and gently fold and stir with a rubber spatula until completely combined. Add the Cool Whip to the bowl and fold it into the mixture until no white streaks remain. 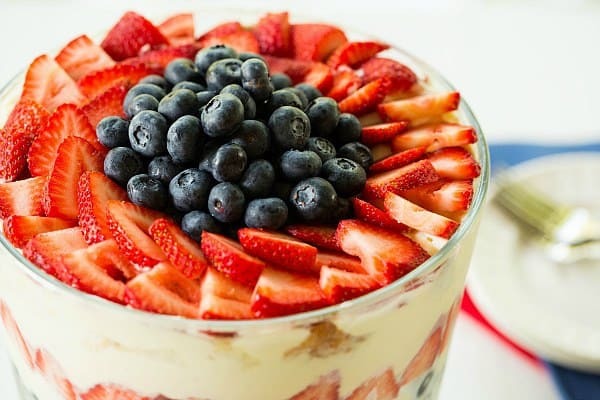 To assemble the trifle, alternate layers of angel food cake, blueberries, the pudding mixture, strawberries and so on, until you get the top. Add a final layer of the pudding mixture, then arrange the remaining strawberries and blueberries in a decorative pattern. Serve immediately or cover and refrigerate until ready to serve. This is best served within 24 hours of making it, but leftovers can be stored in the refrigerator for up to 3 days. This is a great dessert, and probably one of my favorites! I made it for a church 4th of July dinner and received many glowing comments about it before it was quickly all gone. It was very light and slightly sweet, really perfect. I used an angel food cake mix, because the store didn’t have any pre-made angel food cakes. It probably tasted better using the cake mix anyway, and I had about 1/3 of the cake left over. I used low-fat / fat- free cream cheese and cool whip, and sugar-free instant pudding. Some of the other recipes that I saw for this dessert use white chocolate pudding instead of vanilla; I think this is so the custard will be more white than yellowish, if you are going for a patriotic look. If you want the desert to have the best presentation, you can put the white pieces of cake (without the brownish crust around the perimeter of the bowl, and the others in the center. Slicing the strawberries took the most time. Next time, I’ll buy a strawberry slicer. To save time, you can use a knife to slice the cake, then use scissors to cut the slices into cubes. This is a review of the Berry Trifle–a big hit at our recent Memorial Day BBQ. I made the recipe as written, only 1.5 times the size of everything as we had a big crowd. (5.1 ounce package of pudding, 3 cups milk, 12 oz. cream cheese, 1.5 cup powdered sugar, 12 oz. Cool Whip, 3 pints each blueberries, strawberries., one angel food “tube” cake). It was delicious! I assembled the ingredients in a fluted glass bowl (don’t own a large trifle bowl) and used the rest layered in individual clear plastic cups. The bowl and cups I topped with berries in the shape of a star, sliced strawberries around a blueberry middle. So adorably classic ! So patriotic ! So soulful ! This was an awesome post! So many favorite ways to use a fruit! Thank you for so many amazing dishes all in one fantastic post!! Hope you are enjoying all of these great dishes! I know I will be!!! omg this looks soo yummy! Trifles are my guilty pleasure! Beautiful and so perfect for the 4th. Hope you had a great one! this is the perfect 4th of July dessert. Looks so delicious! This trifle looks incredible!! Happy 4th!! Can this get any more beautiful? Really pretty trifle! What a gorgeous trifle! I may just have to make this all year long! That trifle looks like it would be great for any occasion! 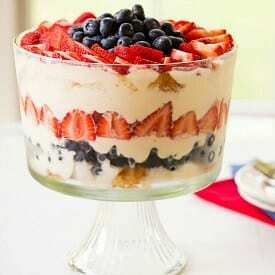 What a perfect trifle for today, beautiful! How adorable for the 4th! This looks deliciously yummy. It contains fruit so it must be healthy too :) Happy Independence Day! Bright colors, wonderful creation. Wish you happy holidays You All! Happy 4th of July! This looks delicious! As an Australian living in London with predominantly American friends, I’m having so much fun getting into the festivities of this holiday. I really enjoy how patriotic everyone is for 4th of July, it’s great watching the creativity with food just bubble over. This looks delicious and well really the type of dessert that you hope company cancels and you have to enjoy it all yourself! Just kidding :) sounds so good in theory. There is nothing better than a gorgeous trifle with fresh summer berries. Gorgeous! I love classic combinations like this! There are times when a bacon, caramel corn ice cream is what you want, and then there are times when only classic berries, cake and cream will do. The 4th of July is one of those times. I can’t find a 3.4 oz instant pudding. I found a 1.34 oz. Is there a mistake in the ingredients cause I would think 3 boxes would be too much. There are two sizes of pudding mix at all the stores I go to and this is the bigger box. It’s a pretty standard size.